After removing two layers of rubber roofing and wet ISO insulation, as well as repairing a small section of the roof deck, we started with a new 1/4″ per foot slope tapered insulation system, spanning over 24 feet run, which gave us a 3 inch difference between the highest and lowest points of the roof, and eliminated ponding water. We had to build a sloped wood nailer along the roof edge, to conform to the slope of the insulation. We also had to follow the two old-style bay windows on the roof, which further complicated the installation process. Once all the tapered insulation was laid out, the IB Roofing membrane was mechanically attached to the roof deck, using special barbed plates and corrosion resistant roof fasteners. All seams, as well as all roof flashing was hot air welded, which created a permanent seam (unlike the glued seams in rubber roofing, which tend to break down and leak after 5-7 years). Once the roofing membrane was laid out and all seams welded, we installed roof to wall flashing and PVC coated 5″ wide IB drip edge metal. Wider drip edge was used to conceal the 3 inch difference in roof level caused by tapered insulation. After finishing the main section of the roof, we began work on the upper, sloped roof section, which was about 400 sq. ft. with two ridges, and four valleys. We removed the old rubber roof off that section, installed 1/2″ fan-fold insulation, and installed a mechanically attached IB membrane, running it all the way up and over the ridge line, to prevent possible roof leaks from the top. Just as a note, the old rubber roof was flushed a few courses of shingles below roof ridge, which caused occasional leaks. We also had to remove two old heating exhaust pipes, and flash the roof on two sides to the rest of this asphalt roofing shingles roof. 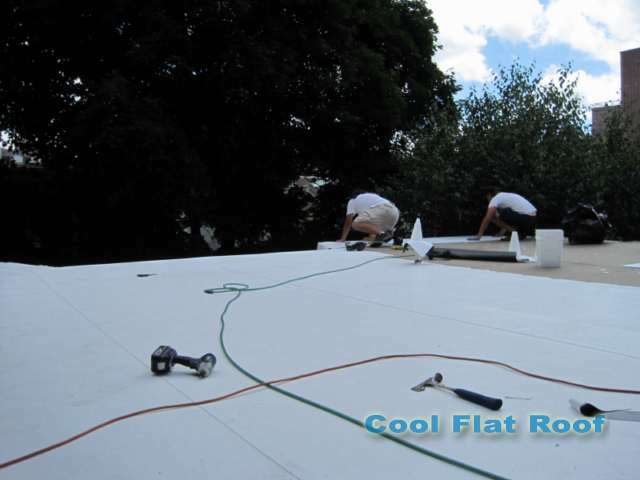 Because of this roof’s irregular shape, we had to use narrow 3 foot rolls of IB membrane, instead of a typical 6-foot wide roll. We used a PVC coated termination bar and an IB drip edge to finish of this roof, and installed two 5″ wide IB membrane vents to remove any potential condensation from under the roof. The third section of the roof was similar to the first one – it was a flat roof over an attached garage. 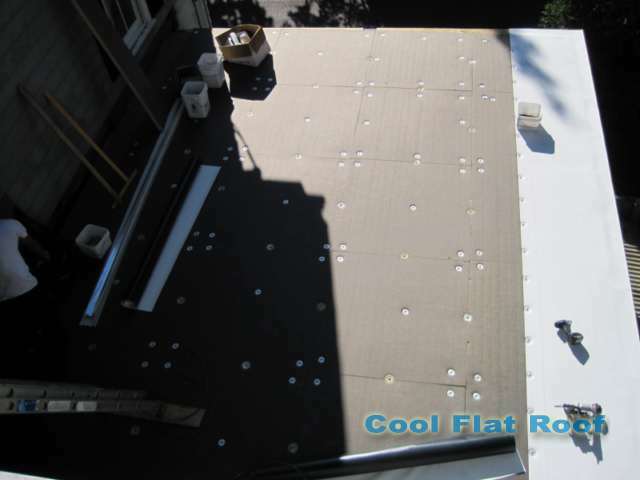 We also had to remove the old rubber roof and wet insulation, install 1/4″ tapered insulation to create the roof pitch for proper roof drainage and to prevent ponding water. We also flashed about 45 feet of roof to wall connection, by removing two courses of cedar shingles siding, and running IB flashing 8 inches up the wall. Once again, the seams were hot air welded, and all flashing we installed were factory prefabricated accessories, such as inside and outside corners, and pipe flashings. 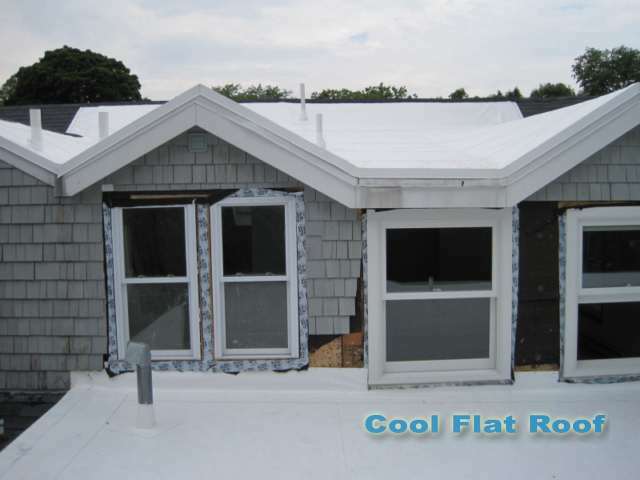 We also used 5″ PVC coated drip edge metal along roof perimeter. The last section of the roof was actually a flat roof deck, with a new floating deck installed on top, over slippers. We used 80 mil IB membrane and also installed special membrane separation strips to prevent the deck rafters from rubbing against the membrane. As you may see in the picture, we used 80 mil IB membrane in red and grey colors. It was important that the up-the wall flashing was grey, to match the color of the siding, while on the bottom, the membrane color was irrelevant, as it was not visible. Because this had to be done quickly, and we did not have enough grey membrane for the whole roof deck, we did not have time to order more materials, and the membrane had to be 80-mil for increased roof durability, we used what we had on hand at the time, which was grey IB membrane from a flat roof deck in Wellesley, MA, and a Red IB roof, which we installed in the in Spring of 2010 – Flat Roof in Quincy MA. 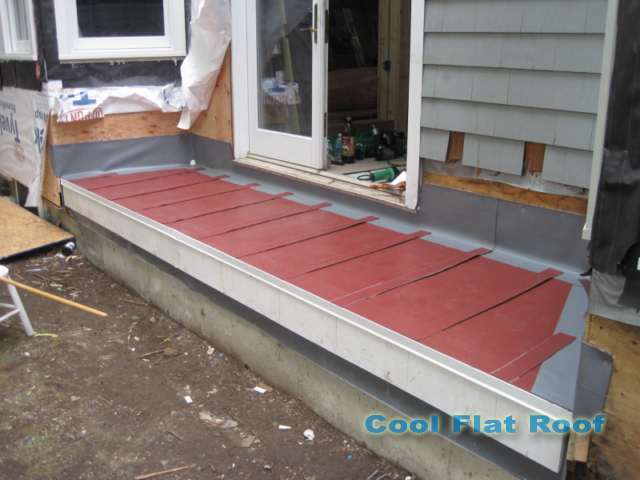 If you are a homeowner in Massachusetts – be it Cambridge or any other city in MA, and your flat roof is leaking – we can repair or replace it. Use our roofing calculator tool to estimate your replacement cost and compare prices to other flat roofing materials. 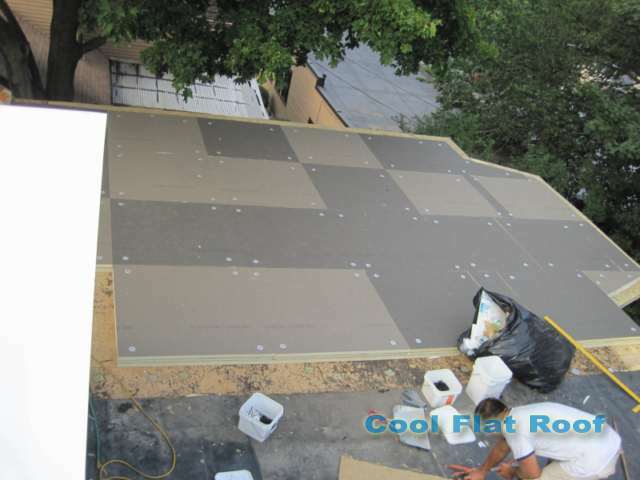 Fill out our roof estimate form to get a free custom price quote to replace your leaking flat roof with new IB membrane. 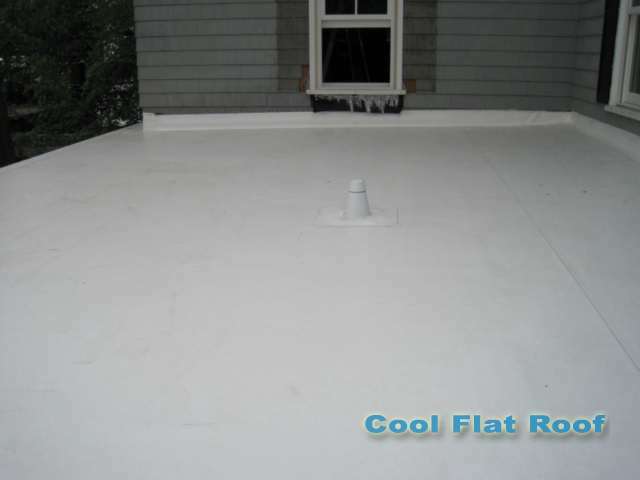 If you have an older rubber roof which is leaking, but can still go a few more years, we can repair it, if you are located in the Metro Boston area. 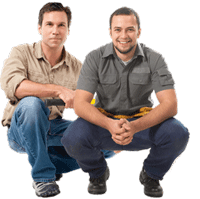 Fill out our rubber roof repair request form and we will contact you to schedule your repair. We will also provide you with a free roof replacement quote, if you decide to replace your flat roof at a later time. 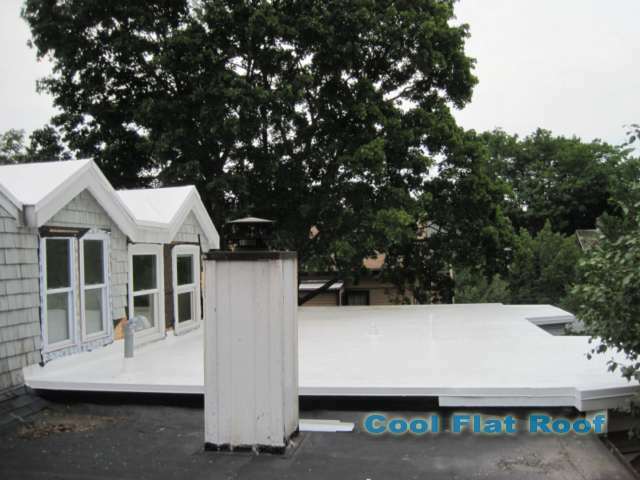 I’ve noticed flat roof installation to be a bit more a specialty roofing, as many local roofing companies around me seem to shy away from this type of job. I would like to install an EPDM membrane over tapered ISO board for a flat garage roof that was leaking. The run is about 30 feet and 32 feet across. Can Iso Board be made to give a 1/4 inch drop (8 inches altogether)? What would be the cost of covering 900 square feet with Iso board to this thickness? P. S. Is there a way that the recovery board can be used to achieve such a taper? So there is tapered ISO insulation that gives you 1/8″ or 1/4″ per foot slope. That’s how you build pitch on flat roof. Since you need 1/4″ slope, we will talk about that. These tapered ISO come in 4×4′ sections with 1 edge being 1/2″ thick, and opposite edge 1.5″ thick. That gives you 1 inch slope. you build it out from roof edge, filling the voids with 1″ flat ISO on 2nd row, 2″ ISO on 3rd row an so on. Costs I can’t tell you off the top of my head, but I found best prices to be at Beacon Supply. However, if you get quote from one supplier, then you can have 2nd supplier “beat” that price, then take quote from 2nd supplier to third one, and so on until you get best price! ISO Insulation is a commodity, and roofing suppliers can’t say this one is a brand name and that one is generic, like they do with roofing materials (TPO, PVC, EPDM, Shingles, etc). Therefore it’s easy to get better price. As far as EPDM, is strongly recommend not to use it. Go with PVC or TPO instead. Your materials cost difference will be minuscule, while quality and longevity is far superior … The most basic example is EPDM starts to shrink after 10 years, and needs replacement, even if it’s not leaking… do you want that? You can use “recovery board” which is basically 1/2″ ISO, but it will be uneven.